no i think it would melt around where the air came in... I have seen my portable forge firepot glowing orange in the past would not try using aluminium. Diuralumin (and Aluminum) melt about 1200 F - Not suitable. I'm not so sure you mean to use aluminum for the support the fire, if so, NO it won't work, it'll melt. If it's going under the forge as a foor for the stand, no sweat, it'll work fine. Where do you hear about aluminum giving off toxic fumes? While it's been years I used to cast al and welded it frequently, I worked with guys who'd been welding al for 30+ years without health issues related to al. For quite a while al was thought to cause Alzheimers till it was discovered the die they were using to stain brain tissue samples was based on ALUMINUM. New dies showed zero connection between al and Alzheimers, none. Simce though I occasionally hear horror stories about al and some unspecified danger. These are generally the same folk who believe vaccines and innoculations are the cause of disease not the prevention. I think the things you're hearing about aluminum are probably related to the smelting of soda cans and the like as it's not the aluminum you should be worried about but the paint on the cans that release toxic fumes. 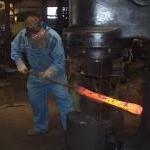 Smelting is the process of obtaining metal from ores. Melting is liquifing a metal. Please do not confuse the terms. I know aluminum welding wire is bad stuff it says on the label produces chemicals that can cause cancer and birth defects or reproductive harm. Almost all welding electrodes carry that warning label today because of California. Just about everything you can imagine causes cancer if you accept what they say. that includes the minute amounts of lead used in brass alloys of faucets for drinking water. The levels of "lead" that are leached from the brass is so minute as to be just about untraceable, but simply because pure lead is "dangerous" they have to put that silly warning label on stuff. I'm not saying breathing the fumes is good for you, only that if you eliminated everything in your life with a warning label from California, you'd be living naked in a field using a book to determine what wild plants won't cause you cancer if you eat them. In all honesty I know guys that have been welding for 30+ yrs and are just fine and still at it. all I would suggest is be cautious and safe. enjoy yourself and have fun. "Sure we recently had two guys who had been working here a long time die..........Both over ninety years old"
Aluminium in itself is not harmful. The alzheimer scare was a mistake. There are no fumes. However, welding electrodes contain some kind of flux and that could be a problem. One should avoid inhaling any kind of fumes or dust - they are a load on the lungs but not many are very harmful in limited quantities. Cigarette smoke and zink fumes are probably those that cause most problems. We have an inherent warning system in the throat that tells us to cough or even to get XXXXXXX out of the place. This is why we seldom have accidents with ammonia. The gas is so obnoxious in small concentrations so people keep their distance. One danger in Aluminium is the low emission factor. Even molten aluminium radiates practically no heat so there is no warning before the burn occurs. It was interesting to re read this old post! Warning sunlight causes cancer so you can't be in the field either! Chris, if you're breathing the thermite fumes you're standing WAY TOO CLOSE ! Didn't you read the label? Sorry Chris, I was thinking sort of mix powder 'A' with powder 'B' put in clay flowerpot, suspend over mold and ignite with magnesium ribbon(sparklers as cheap substitute) setup. Standing over and breathing fumes is way too close, here. I'm with you on the dangers of grinding dust. I see you had the same Jr high school chemistry teacher I had. LOL. How to make thermite was one of the few things I remember from chemistry class. How to make dust explosions was #2 and came from the same teacher. Those were the days. Flour, a straw, a candle and a Whooof! We lit thermite with potassium permanganate and glycerine. I don't even want to know what's being done in jr. high chemistry classes to impress the kids now. My Father talked about going on a middle school field trip to learn how to blow stumps. He also brought in a pool table for inelastic collisions and vectors. it made understanding energy transfer from A to B and angle in/angle out so much easier to understand. I had a history teacher that set fire to the 'school rules' posted on the back of the classroom door to show how anarchy and revolution start! I still remember that class clearly. Some teachers just get how to implant ideas, interest. That one started a lifetime's interest in history(which up to then I had thought of as interesting as an old 'lawn cigar' ). The more I study history the more I am amazed at the absolute level of Genius it must take to make it dull and boring! History is the study of people doing wild and crazy things---and getting away with it or *not*! I never enjoyed a history class. I grew up when "history" was the process of memorizing names, places and dates. That's how you make the story of humans doing what humans do dull and boring. "The American Airforce bombed Berlin 1943-1945, end of lesson." There was a "famous" high school history teacher who answered ANY question with, "When you've gone to school as long as I have you can ask me questions." I was immediately transferred to a different class when I replied, "If I'd gone to school as long as you have I'd be able to answer questions." Marat was assassinated in his bath; (famous picture of him there). De Sade outlived him by about 20 years dying in an insane asylum. Don't get me started on history today. The customer had the TV news on when I came over to work this morning. 10 minutes of them jumping from one local 4th of July parade to another over the PA, NJ, De area, mostly talking to WWII vets, 5 minutes of the weather around the area for the day, then 30 minutes talking about the "celebration" of the 50th anniversary of the LGBT movement in Philadelphia. Not word one about the history of the founding of our country, in the city where it all began with the Declaration of Independence! What a wonderful way to remember our national history on the day we celebrate the founding of our nation.